On Tuesday night, while I was half-watching MSNBC, I kept one eye on Twitter. As the outcome of the election became clear, the rise in emotion was palpable. People were processing the result in so many different ways: in tweets of mourning, in calls to action, in blame and recriminations, in critical analysis, in “I told you so’s,” and in silence. I certainly had no idea what to write. Since then, a lot of thoughtful things have been said about the election. My inbox is full of essays by progressives and activists of all stripes exploring what this means, what went wrong, and what comes next. I don’t have any ground-shattering wisdom to add. But I do want to take a moment to share some thoughts, as I look at this election through the lens of cultural organizing. These are things I’ve learned from the amazing artists, cultural workers, and organizers I’ve had the honor to connect with. I find some comfort and direction in them. More than anything, I offer this essay with love and gratitude to all of you. Among the many dynamics at play this election season was a failure of political imagination. Liberal politicians could not fully grasp the levels of anger and frustration coursing through the nation. Meanwhile, conservative politicians fell back on fear and hate, when hope is what was needed. But while imagination at the highest levels of power may be stunted, it continues to thrive in communities across the country where artists, cultural workers, organizers, and so many others are imagining and crafting new possibilities. We will need all of our combined creativity in the coming months and years in order to push back hate and make room for transformation. Every four years we are forced to channel all our hopes, fears, values, and dreams into an either-or choice between two people. 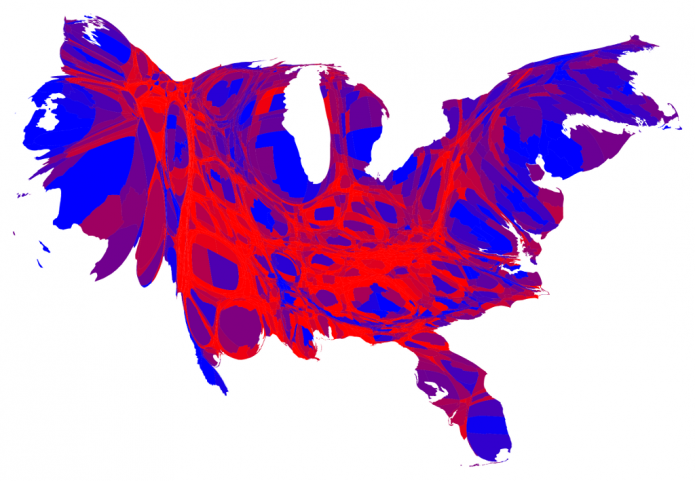 We are then given a map covered in red and blue, and fed a story about “two Americas.” This is a deficient narrative that does little to explain the complexity of our country, and even less to guide us forward. There are certainly many divides in our country, which were brought into stark relief during this campaign. But to address them we will have to put aside this single story, and get back to telling the multiplicity of true stories that capture who we really are. The country that elected Trump is the same country that elected Obama. We enter into this new era with a powerful movement proclaiming the value of Black lives, an increasingly diverse and politicized pop culture sphere, a large cohort of young immigrant rights leaders with skills honed in recent struggles, and a plethora of new voices amplified through creative use of social media. I don’t believe, as some have said, that the “whitelash” we saw in this election is necessarily the “last gasp” of the old order. Whiteness surely has more tricks up its sleeve. But the strength of the backlash should signal to us how strong the forward movement has been. I don’t share these thoughts to deny anyone their anger or sadness, to say “it’s going to be fine.” There are dark times ahead, and many fights coming. If you need to mourn, mourn. If you need to organize, organize. This is where my mind goes as I try to sort through all my thoughts and feelings. I would love to hear your thoughts as well. Sharing our stories is a necessary first step toward healing and change.